Me: OK kids, nap time! Go lie down and I’ll go get my book. Kaius: You mean your McDonald’s book? 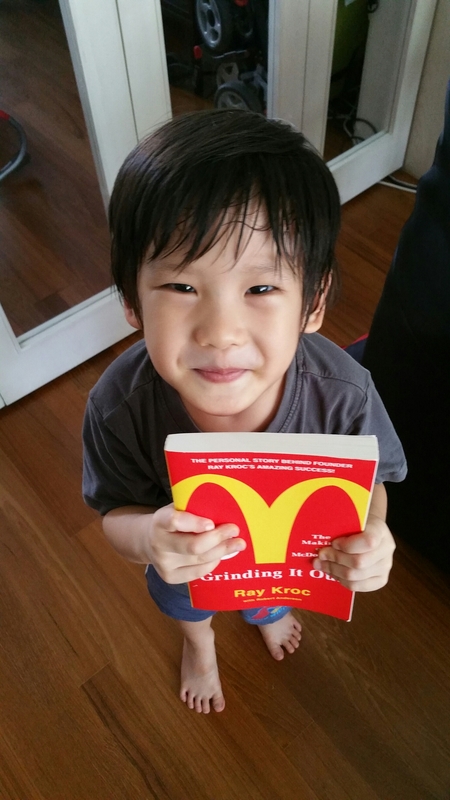 Me: (amused) How did you know it’s a McDonald’s book? Kaius: Because I saw the McDonald’s sign and I was reading it just now. Wow. My son is a lot more observant than I give him credit for and he’s growing up fast. How can I not fight to be a good example for him? Kaius with Grinding It Out. The Making of McDonald’s by American businessman Ray Kroc. He was responsible for making McDonald’s into the world’s most iconic fast-food brand.